← Huge News! DIA Video Admits Agenda to Depopulate Now in Effect! Probably what could be accurately termed “opening a can of worms”. My previous post “Huge News! DIA Video Admits Agenda to Depopulate Now in Effect!” includes a video which includes a reference to the “Georgia Guidestones”. This raised my interest as I had previously heard of them, was set to wondering, but had failed to follow that up. Certainly they pertain to, or at least coincide with, the New World Order agenda, but although they are almost always referred to “Luciferian”, it is probable that this is a “value” added term from presenters who see the displayed “Commandments” as being anti-Christian. I agree with their presence being associated with what I would term ‘evil’ but that is not quite the same thing. The ‘Rosicrucians’ are likely to be associated with the creation of this incredible stone edifice and are just as likely well and truly part of the NWO hierarchy. However, nowhere have I seen any genuine link between these movements and any recognised Luciferian organization. Not that I have any argument with the suggestion of the NWO being anti-Christian in its philosophies and policies, but it is a bit of a stretch of imagination to justify the introduction of “anti-Christ” and/or the devil in any of “his” forms. I could of course be wrong, but to keep our feet on the ground, so to speak, is enough to assess and understand (or try to), the destruction of civilization and humanity by a group I often refer to as “the ungodly”. Always a figure of speech without really invoking the spiritual. A term perhaps really meaning “anti-humanitarian” or being ‘hedonistic’, perhaps. So, we come to the “Georgian Stones” and their Commandments. These and their existence are highlighted to show that this NWO issue is real, active and influential. Not theoretical, nor imagined, nor a conspiracy theory – but factual and significant – a force to be reckoned with. Definitely worth a posting here. So I refer to one of the internet search result sites which seems the more sensible and less unbiased – from http://eliora.hubpages.com as significant information about the ‘Georgia Guide Stones’. I am much more comfortable in studying this information without going down the religious path. The primary message of the Georgia Guidestones is mass genocide. What most experts have deduced is that the Georgia Guidestones are intended as a guide to the survivors of an apocalyptic event as a way to govern society in the future. An ‘elite’ group connected with the New World Order, the Rosicrucians, who are a Luciferian secret society are purportedly responsible for their message. The plan of this “elite” group is a global religion, world courts and drastic global depopulation. 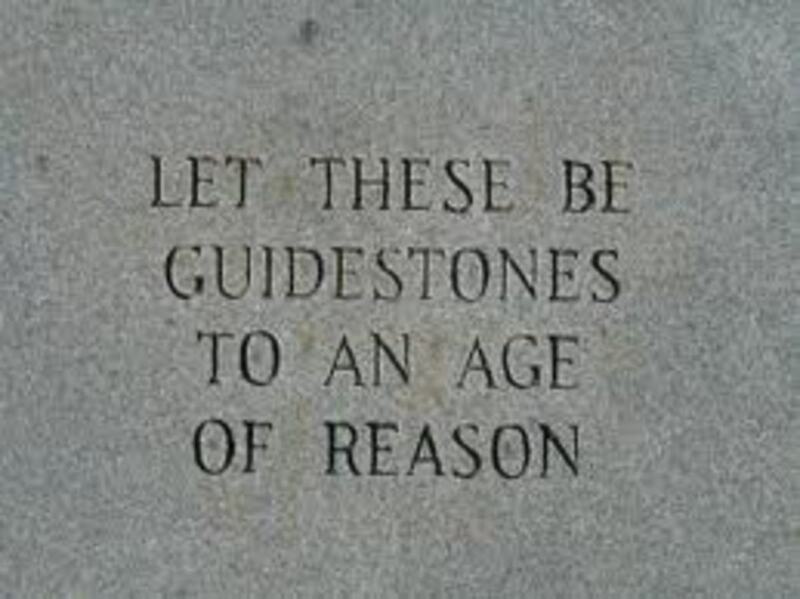 Opponents claim that the Guidestones have a deep Satanic origin and have attacked them as the Ten Commandments of the Antichrist. (My emphasis, yet, the author refers above to the Rosicrucians being Luciferian, again disputed). I seriously challenge the logic of the use of the ‘Age of Reason’ being associated with what is tantamount to mass murder. This entry was posted in AGENDA 21, Conspiracies, Globalism, Human Behaviour, New World Order, World Issues and tagged Depopulation, Genocide, Georgia Guidestones, New World Order, NWO Commandments, Rosicrucians. Bookmark the permalink. Since the time of the tower of babel that language was confused, the synagogue of satan over the generations has used symbols & signs to communicate. The secret of Freemasonry is they mingle their seed with the seed of man, that man cannot be with G-d, returning man to… as it was in the days of Noah. All knowledge given by the blood sacrifice to worship the fallen are as a trinket to separate man from his dual nature. To enhance the physical as transhuman for few and the surviving masses as slaves of short lives. The destructive geoengineering contain the off world nano robotic array and pass the blood/ brain barrier in constant communication. Once the pineal gland is calcified you can no longer connect spiritually to G-d. Like a zombie instruction embedded within the global electronic cage, you are led by psycoenergetic frequencies to accept the lies. To take the mark that you cannot die, yet will desire death once truth is revealed. Only by repentance unto spiritual relationship may we .follow the leading of the Holy spirit as in all creation. We rejoin our brothers of the angelic while bound to the flesh, by answering the call of our visitation predestined from the foundations of the world. Sin is to do other than this, as we would only do as we will, and not the will of Abba. Those that hate G-d do not live by his statutes laws and commandments and do not have fruits or gifts of the spirit, as we are commanded to pray in tongues, which reverses the confusion that the fallen do not comprehend this intimate communication in our relationship with Abba. We will KNOW to prepare and survive, by keeping Torah, without which we die. Many are called, but few are chosen from the foundations of the world. Some will die to everlasting life, and the remnant will never know death, and even a few will raise the dead, doing greater things than the son of man as he has told us. The spiritual call has gone out to Ephraim to come home. We are to become prepared for the day e will return to the land that is ours. .
See the latest on my obscure blog to learn of the implementation of the cashless biometric authentication methodology unto the mark of the beast. This is instant once the preparations are complete. Parse syntax grammer math interface This turns the captured world of commerce from the law of the admiralty, over to the beadt, that no man may buy or sell save he that aceps the math interface by use of the technological means that is the medical procedure of the RFID chip. One becomes Nephillim as the DNA is altered and there can be no returning. ONLY the son of man is worthy to open the book of life. The DNA is read as a book. As in the temple of Solomon, the body IS the temple, designed to have the dwelling of his spirit. Our temple is therefore not our own. It is the temple of G-d..
Hi David, this is a bit complex for me to follow. However, in the interest of free speech it has squeezed through the spam filter. Perhaps another reader would like to comment on this. The mark is actually accepting the sabbath for sun. when it’s actually sat. The Vatican is the lion with the 7 heads (regions) .